Today is May the 4th, a day recognized by Star Wars fans the world-over as Quatro de Mayo and a day that I have the pleasure of sharing the third in my trilogy of interviews with one, Megan O’Russell. 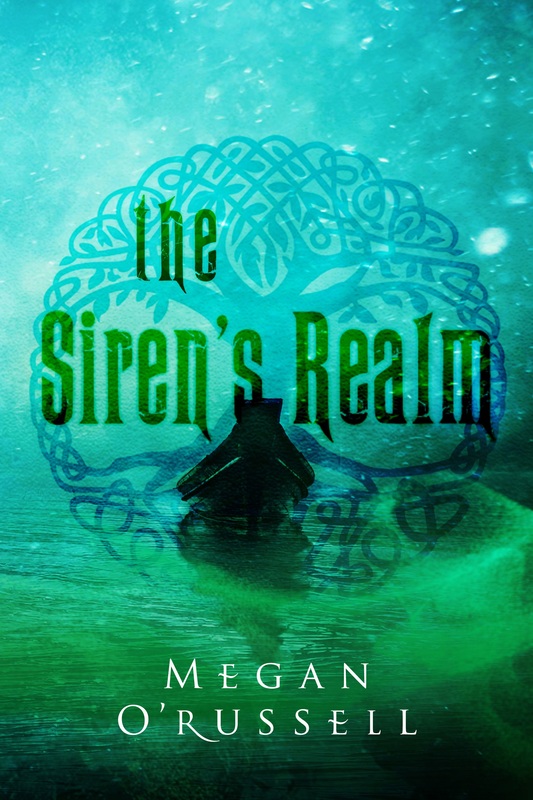 Megan’s second novel, “The Siren’s Realm”, has just been published and is the second book in The Tethering series. I’ve had the pleasure of reading “The Siren’s Realm” and, once again, I had to ask myself, “Why in the world does someone with her writing skills continue to say ‘Yes’ to my interview requests?” I didn’t ask Megan this question in this interview due to the fact that I didn’t want her to start wondering the same thing. The questions I did ask, however, should provide you with a little more insight into Megan’s mind and her new book “The Siren’s Realm”. Enjoy! First off, congratulations on publishing your second novel “The Siren’s Realm”, the sequel to your first book “The Tethering”! How does it feel to have two books under your belt? A little strange. Everything has been happening so fast! But I am thrilled to have The Siren’s Realm out to the world. For all of my fashion-conscious readers I have to ask: Whose belt are you wearing? At the moment, I’m in my bathrobe, so that gray polar fleece belt is all mine. Very nice. For the record I’m wearing sweatpants. At any rate, can you tell us what “The Siren’s Realm” is about? I have a blurb for that! Jacob loves Emilia Gray, but things aren’t always that simple in the world of Magickind… The war has begun. The Dragons are gaining power, and the Gray Clan stands alone. Desperate to find a way to stop the Pendragon, Emilia is forced to seek answers from someone who hasn’t been seen in seventeen years . . . Her mother. Embarking on a magical journey filled with witches, wizards, centaurs and a dangerous and powerful Siren, Jacob and Emilia must take a leap of faith to a land neither could have ever imagined . . . and hope they can then find their way home. What, if anything, was different in the process of writing and publishing “The Siren’s Realm”? There were a lot of differences. For The Siren’s Realm I already knew the characters and the world of The Tethering Series very well, so that streamlined a lot of the writing. The most difficult part was figuring out how to remind the readers about the rules of magic and the happenings of the Gray Clan in an expedient and subtle way. Editing was also a lot simpler this time around. I didn’t have to switch publishers halfway through the publication process, so that made things a lot less stressful. I’ve really enjoyed reading both of the books in The Tethering series and I can’t wait to read the next offering. How many books do you plan on writing for the series? It’s going to be a four book series with a few short stories scattered throughout. I managed to wait until question #6 to bring up the fact that one of the characters in “The Siren’s Realm” is an accountant, are you impressed? I thought you might be. While we are on the subject, who, if anyone, inspired you to have one of the characters (my favorite in the series so far) in “The Siren’s Realm” be an accountant? Well, I happen to know a pretty cool accountant. It seemed only right that The Siren’s Realm include such coolness. I see. You’ll have to introduce us sometime. Am I correct in assuming that the accountant/wizard will end up being the most powerful character in The Tethering series? No. Things aren’t going to go well for the accountant. Sorry about that. Ha ha ha ha ha! That’s a good joke. You are joking right? Right? Anyway, this is a little off-topic but I have a co-worker who uses the word conceive instead of concede (i.e. they say, “I conceive the point”), how does that make you feel? Indeed. This is the third time you have agreed to do an interview for my blog, do you feel like you have made a mistake in doing so? Your author’s note states that you play the ukulele, is this true? Yes! I love my ukulele. It’s the only instrument I can actually play. Besides the triangle. I’m pretty good with the triangle. But the tambourine is still too advanced for me. I was thinking about writing a theme-song for my blog, can I commission you and your ukulele to perform this song? Besides recording the official Accounting 4 Life theme song, what else have you been up to? I’m working on a few different projects. The third book in The Tethering Series, The Dragon Unbound, has just gone in to my publisher. I also have a few other projects that I’m prepping for submission. With all that and being on stage, I’ve given up on sleep. If you could trade places with any author or actor for a year who would you choose and why? I would trade with J.K Rowling. I would live in the Wizarding World of Harry Potter in between jaunts to the farthest corners of the world. So really I would just use her status to get unlimited butter beer and her money to travel. Today is May the 4th so I have to ask: Which Star Wars movie is your favorite? My husband says I like Empire Strikes Back the best. Do you think Star Wars would have been an even bigger franchise had one of the characters been an accountant? I think they wouldn’t have built the Death Star if they had known what a money pit it would be. Once again, I thank you for taking some time to be on my blog and I can’t say enough how much I have enjoyed reading “The Tethering” and “The Siren’s Realm”. With that said where can my readers purchase your books? Thank you so much for giving me the honor of once again being interviewed on Accounting 4 Life!